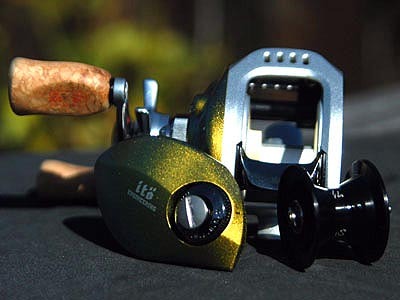 Introduction: Late in October 2004, we published our Team Daiwa Extreme Collectibles Article explaining how Daiwa Japan has, almost single handedly drove many a tackle enthusiast bankrupt. Since that article's debut, we've received countless inquiries for further information on many of these works of art. With that in mind, this editor took one of the most prized items in his collection out of its case and mounted it onto several different fishing rods for the prototypical TackleTour review. Pull up a chair as we give you our true thoughts behind the 2003 TD-ITO 103M/103HL. It is difficult keeping one's hand steady while admiring the perfection that is the TD-Ito. The not so subtle use of color, light weight, and unique grip material are truly astonishing at first grasp and grows only more astonishing the longer you admire the reel. One cannot help but to continually rotate the reel in hand checking out every angle, every inscription, every sparkle of the pearlescent green finish. The only thing that seems to be missing from the package is a matching reel cover to protect these functional works of art. Field Test: As an avid admirer of finely crafted and exquisitely designed items such as the TD-Ito, it took a lot of convincing by my fellow editors to take these beauties out of their packaging and mount them onto fishing rods for an extended tour of duty. After all, how heartbreaking would it be to subject one of these reels to the inevitable scratch or boat rash accident? Such is the delirium inspired by these unique creations. Setup: Each of these reels were mounted on a variety of fishing rods for our field tests, but no reel seat was quite as welcoming as that of the Megabass F7-711X and F6-69X. For line, we spooled one with 20lb Berkley Fireline and the other with 15lb Seaguar Carbon Pro. Carefully detailed, the TD-Ito is truly a work of art. 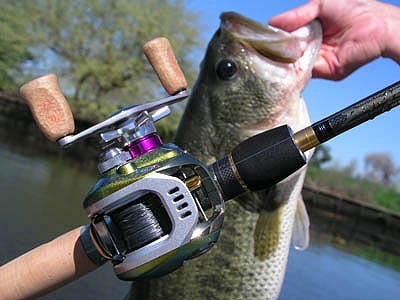 Casting/Pitching: The TD-Ito is an incredibly easy reel to both cast and pitch. While it is purposely super tuned to facilitate delivery of ultra light presentations, we found the limitations of our TD-Ito reels to be right around 1/8th or 3/16ths of an ounce. We attempted some casts with a 3/0 splitshot under controlled conditions but we were unable to achieve any useful distances. Otherwise, more traditional sized lures were cast with little difficulty including 5" senko's, weighted plastics, spinnerbaits, and lipless crankbaits to three-quarters of an ounce. More detailing from the beveled cutouts on the front plate to the purple highlight underneath the dragstar to the titanium nitride line guide - the TD-Ito is exquisite. Retrieving: Gearing during retrieve is smooth and quiet much akin to the typical Daiwa magnesium framed reels, but the added touch of coated, cork knobs adds an interesting tactile sensation. With a 6.3:1 retrieve ratio, the TD-Ito pulls a lab tested twenty three inches of line per turn of the handle that we found best suited to fishing plastics, lipless cranks, and other baits where a quick retrieve is beneficial. Large Colorado blade spinnerbaits and deep diving cranks while possible with this reel, were not the most comfortable to retrieve due to the relatively quick rate of retrieve. Access to the spool of the TD-Ito requires removal of the sideplate. Drag: The TD-Ito topped out at 5 lbs of maximum drag pressure in our lab and proved to be smooth and non-shuddering in the field while battling schoolie size striper, spotted, and largemouth bass. Remember this nine pounder? We found nothing lacking in the drag performance of this reel. 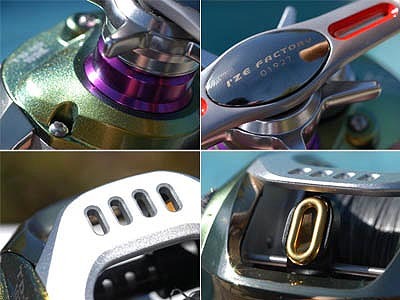 Adjustment of the drag system can be done with exactness with the ergonomic drag star, and to those already familiar with the Daiwa TD-Z's smooth and consistent drag the Ito feels near identical. 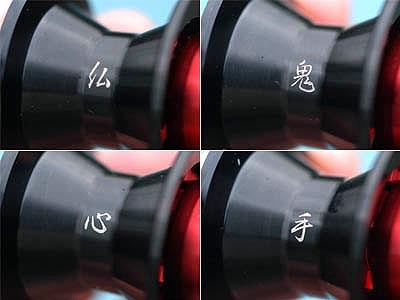 The four characters inscribed on the TD-Ito spool. On the left, Bu (top) Shin (bottom) represent "Buddha heart". On the right, Ki (top) Shu (bottom) represent "hand of the devil". Ergonomics: The profile of Daiwa's TD-Z reels are among the most comfortable to palm and the TD-Ito, built upon this frame, is no exception. The advent of an exterior dial to adjust the braking force and micro-click adjustable drag and cast control are all big pluses and something we expect to find in a reel of this caliber. One thing we did not like about this reel is absence of a hinge mechanism for the sideplate when opening the reel up to access the spool. Instead, the sideplate comes completely off the reel leaving open the possibility of dropping it in the water, on the boat, or on the ground where damage to the magnets or sideplate itself are possible. It doesn't get much better than a TD-Ito mounted on a Megabass Super Destroyer III and a nice, healthy 9 pound largemouth bass at the end of the line. Design: Perhaps one of the most noticeable design features of the TD-Ito (aside from its unique color scheme, cork knobs, slotted top plate) are the four Japanese characters, Ki, Shu, Bu, and Shin, inscribed on the spool and stamped on the knobs. The composition of these particular characters originate in the Ancient Chinese philosophy and religion of Taoism. Interpretation of this proverb, in relation to fishing, can be taken as a warning to he who wields this work of art that "while this reel transforms your hands into tools that allow you to fish 'like the devil', don't let the transformation spread to your 'Buddha heart.' Fish with mindfulness." Such a proverb brings to mind a more light hearted, contemporary, and media inflicted adage recited by a character of similar hue to the sideplates of the TD-Ito. A current day proverb that the majority of Tackle Enthusiasts know too well. Conclusion: Certainly not the perfect little reel, but given the totality of the design effort behind this exquisite piece of machinery, there is a very real and difficult sense of overwhelming enthusiasm to avoid when grasping one in your palm. 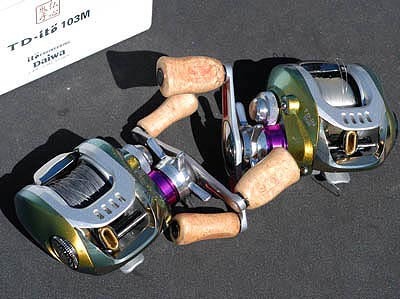 In fact, if I could be certain the finish on the TD-Ito was indestructible, I might not fish any other reel while in pursuit of my favorite quarry, black bass. However, the inevitable heartbreak of that first pin-point sized nick in the paint or other errant boat rash-like blemish is just too much to bear. 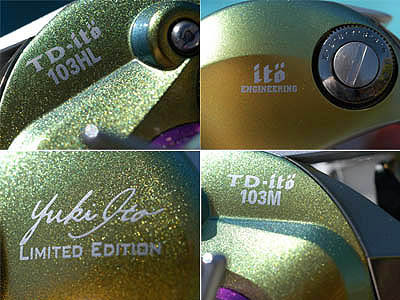 For many, this editor included, the TD-Ito represents the pinnacle of what this tackle obsession is all about. Practical? Hardly. Insane? You better believe it, and I wouldn't have it any other way. Until next time - keep collecting!